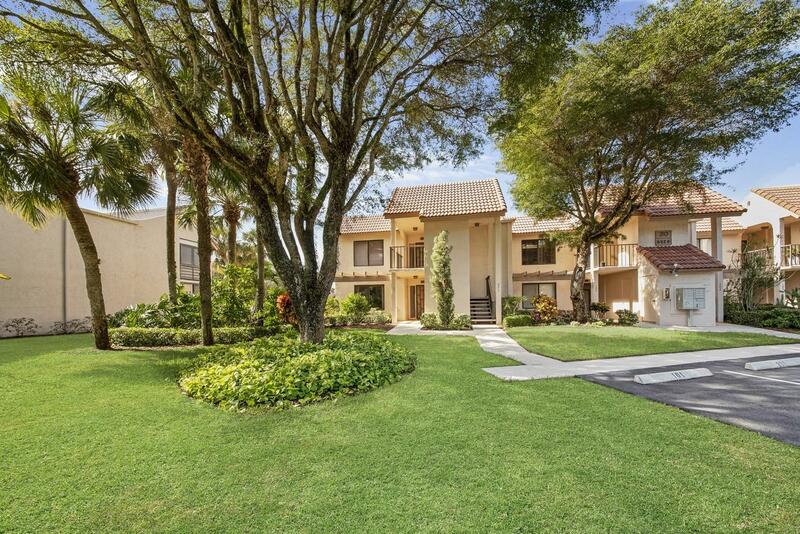 Experience the active Florida lifestyle in this charming first floor corner unit condo with a lakeside view. Upon entering this 2 bedroom, 2 bath condo, you are greeted by a spacious living area with neutral finishes and an oversized slider that frames a picturesque lake view. The eat-in kitchen is equipped with stainless steel appliances, plenty of cabinets and a large window that floods the space with natural light. The master retreat features a slider to the patio and an updated en-suite bath. Entertain friends on your spacious enclosed patio or just enjoy a quiet evening taking in the lake view. Stylishly renovated bathrooms, neutral carpeting, lush tropical landscaping and an abundance of natural light complete this home.